In April 2015, there were around 5.4 million job openings in United States according to Bureau of Labor Statistics. 3.7% is the calculated job opening rate for April 2015. There was also a new trend which indicated that a surge of new job opportunities was available in the private sector, though in the government sector the scenario remained the same. Healthcare and social assistance had more jobs, while a decline of jobs in entertainment and arts was noticed. Keeping the current job scenario in mind, if you have finally received a job offer and are tempted to say an immediate “Yes”, it is essential that you are evaluating a job offer. When reviewing the job offer you must understand the terms and conditions associated with it and also affirm if the compensation offered to you by the company is at par with industry standards. If you are confused regarding what are the basic questions that you need to analyze, we have on our part aided you in this attempt below. Can a job offer be considered as an employee agreement? Employee agreement makes a job permanent. Today most of the jobs offered by the employer are based on the doctrine of employment at will. But most job offers offered today have a set of terms and conditions which assure the employee that his job will not be suddenly terminated and if it is terminated it would be on the basis of the terms and conditions discussed in the job offer. Here you have to understand that the job offer does assure that the job being offered is permanent. Most job offers are offered to the prospective candidate after the interview process has been completed and the candidate receives the job offer which is contingent in nature. You have to understand that this job offer is conditional and you would need to clear your background verification checks and physical examinations before the final job offer is sent to you. This usually happens after you have joined the company. When a company offers employment agreement to a senior management professional, this agreement becomes an executive employment agreement and every single component of the agreement is negotiated. The employment at will outlines the fact that both the employer and the employee has the right to terminate the job at will. Here both the parties do not need to give a specific reason or issue a notice in advance regarding the fact that he would no longer be working in the company. However it should be noted that employers cannot just layoff an employee and their decision should be based on certain facts which have to be documented and proved. If an employee receives an employment agreement then he should understand that the agreement is not based on the employee at will doctrine. Thus he cannot be fired by the company and certain terms and conditions have to be followed strictly here. One of the most important elements here is that the employer or the employee would need to give a written notice in advance which could be around 30 to 90 days. The employment agreement has certain expectations from the employer regarding certain duties the employee needs to undertake and duties would be measured over a specified period of time and remunerations would follow. In most instances employment agreement contains elements of non-disclosure, non-compete and confidentiality clauses. How To Write a Letter and Confirm your Acceptance of Offer Letter? After the euphoria of receiving the job offer settles down you would need to read the job offer thoroughly. It is best to make a Xerox copy of the job offer mailed to you. When reading the job offer letter you should highlight the areas where you think you need clarifications and points on which you are planning to negotiate with the company. Before you write the points of negotiation, you should do a thorough market research on them and collect the facts which would help you to negotiate the job offer. Here you should understand the date by which you have to confirm the job offer or else it would be nullified. In case you need some extra time at hand, you can request for it in the mail to the hiring manager. Most employers expect the fact that you would confirm within 7 days and the job offer mail is preceded by a phone call from the hiring manager of the company. 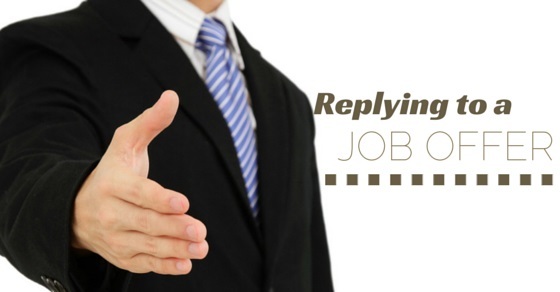 Once you have read the job offer and are deciding on accepting offer letter, you should write a job acceptance email. The job acceptance letter should be written to the hiring manager who has mailed you the job offer. The opening salutation should contain his name and designation. Then you should mention thanks for the job offer that the hiring manager and the company has provided you and mention that you are accepting a job offer. The letter should be simple and very concise in nature. Remember the hiring manger and company should get the impression that you are organized and meticulous in your work. In the end you can mention that you are looking forward to join the company and contribute to its growth in a major way. Here you should confirm the date of joining the company. How do you negotiate the job offer? 49% Americans do not negotiate on their job offer. If you are planning on negotiating job offers on a few terms then it would be best to mention the points in the job offer letter of acceptance. After you have sent the mail, you can call the hiring manager and notify the fact that you have accepted the job offer but have a few points which you would want to negotiate on. The hiring manager might discuss the issues over phone or request you to visit him in the office for a face to face discussion. It is mandatory that you are prepared for a grueling negotiating discussion and armed with various facts to confirm that your job offer negotiation is valid. During the face to face discussion with the hiring manager, your body language should be positive and your tone should be professional. When negotiating your points you have to listen to the hiring manager and also counter the points he is offering in this regard. Here you should not appear very aggressive but point out professionally the value addition the company would enjoy, once you join the company. In the end the hiring manager would take some time to get back to you and you have to be patient enough to give him the needed time. In case the hiring manager outright declines and maintains that he cannot negotiate your terms and conditions, you have to accept the fact that the negotiation has fallen off. Here you can either accept the job offer or decline job offer politely. You might get the impression that you are the perfect candidate for the job offer. But on a closer introspection certain facts might be revealed which might make you withdraw from the job offer. As a candidate you can withdraw from the job offer but you would need to do a few things so that your professional reputation is not tarnished. When you receive the job offer you would need to read it well and understand the terms and conditions offered to you by the employer. The job offer you have received would be contingent in nature and it would indicate that a final offer would be sent to you once your pre-employment checks are conducted and are positive. Since the doctrine of employment at will is present here, the employer can fire you under any circumstances. But you have to note that the reasons should not be discriminatory and be based on your race, religion or gender. Recruiting the right candidate is very important for a company nowadays. Thus the employer might promise the Earth and the Moon to woo the candidate. However when they join the company they realize the expectations has not been made and they might incur additional expenses like relocation expenses. Here the employee might issue promissory estoppels for the employer. In most cases the employer rescinds the job offer quickly and this would be bad for the employee. What do you do if the company retracts the job offer? In case the job offer is retracted, you as a candidate can sue the company. But before taking any legal action, you should speak to the company and understand why such a stand was taken and what the reasons behind it are. Here the company might mention that immediately they cannot employ you as the project for which you had been recruited has been postponed, and thus they would recruit after a few months time. In other instance the company might undertake a reasonable settlement with you and here you should consider it if the terms are appropriate to you. The above discussion is simply an effort to educate the candidate regarding how to reply to a job offer well, as much significance is attached to it and one should not take it lightly. Remember once you reply to the job offer in an appropriate manner, the company would be happy that it has recruited a professional who is well versed in business writing skills and is also able to maintain good relationship with existing peers. Such an impression would benefit you and help you to work efficiently in your new job in days to come.